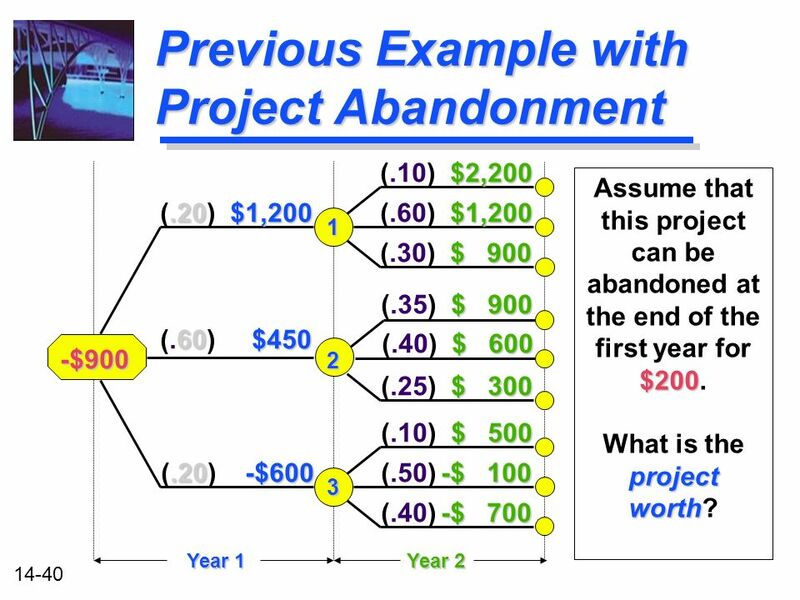 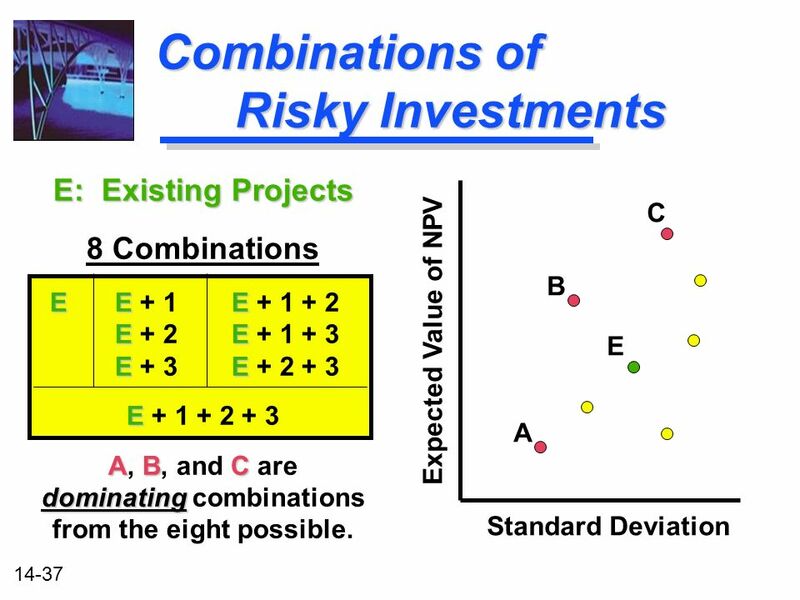 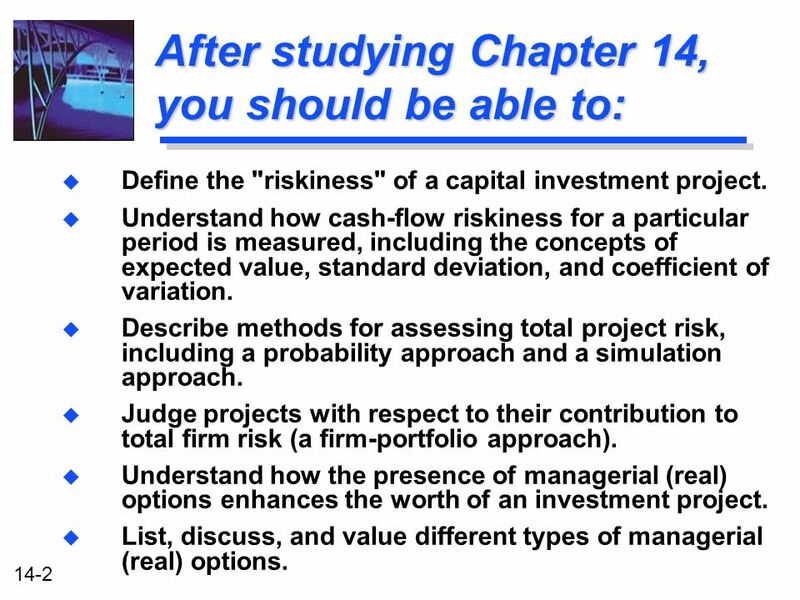 2 14-2 After studying Chapter 14, you should be able to: u Define the "riskiness" of a capital investment project. 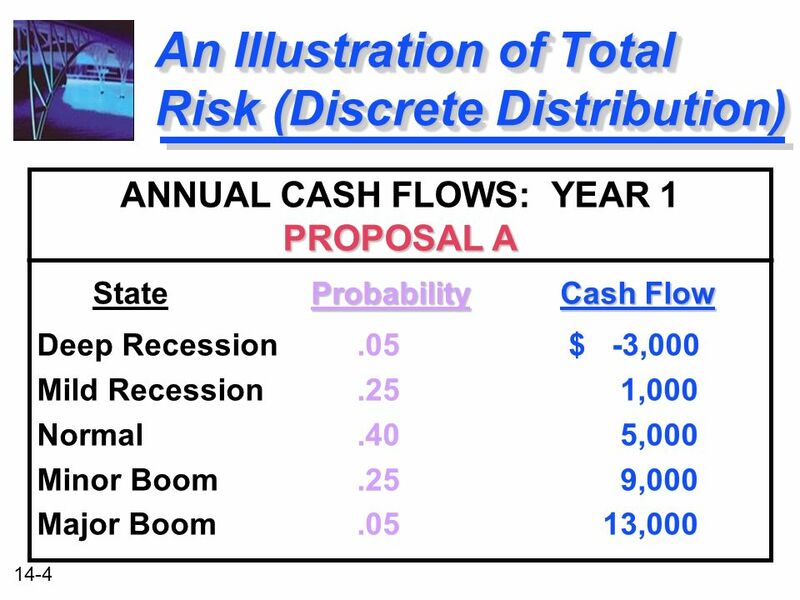 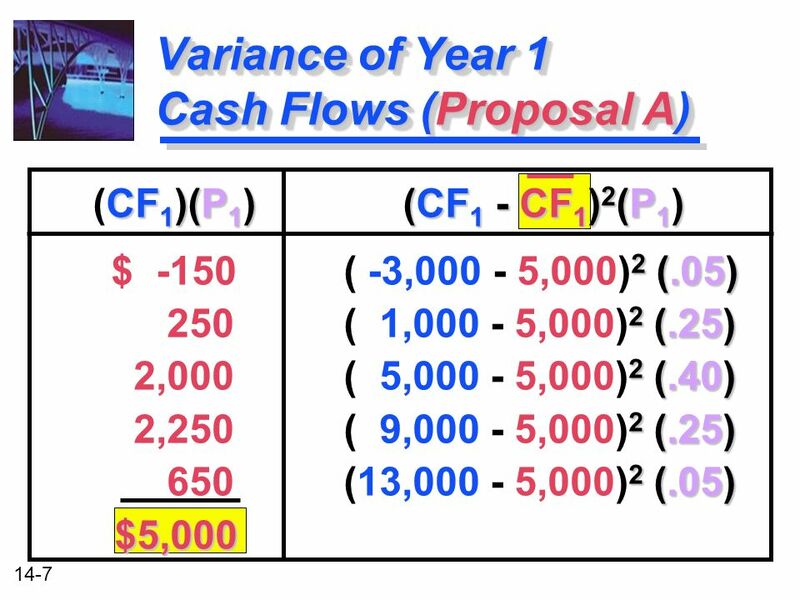 u Understand how cash-flow riskiness for a particular period is measured, including the concepts of expected value, standard deviation, and coefficient of variation. 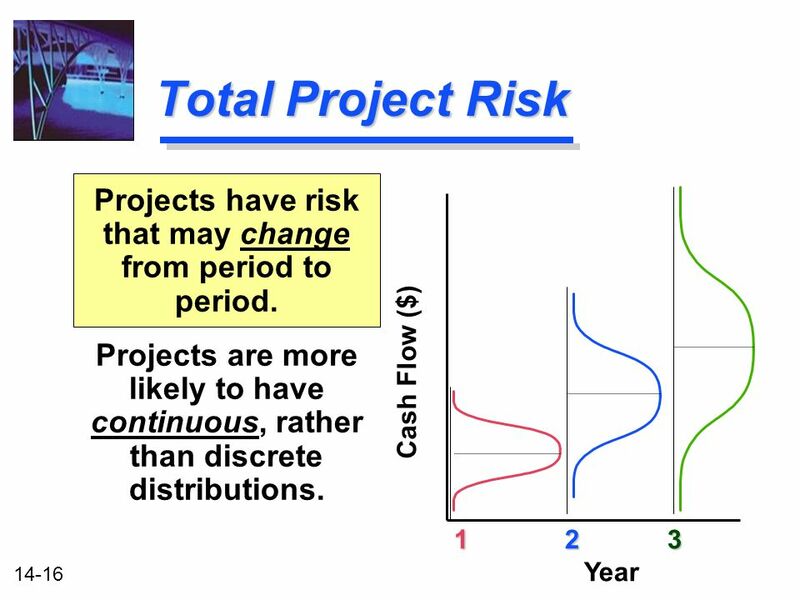 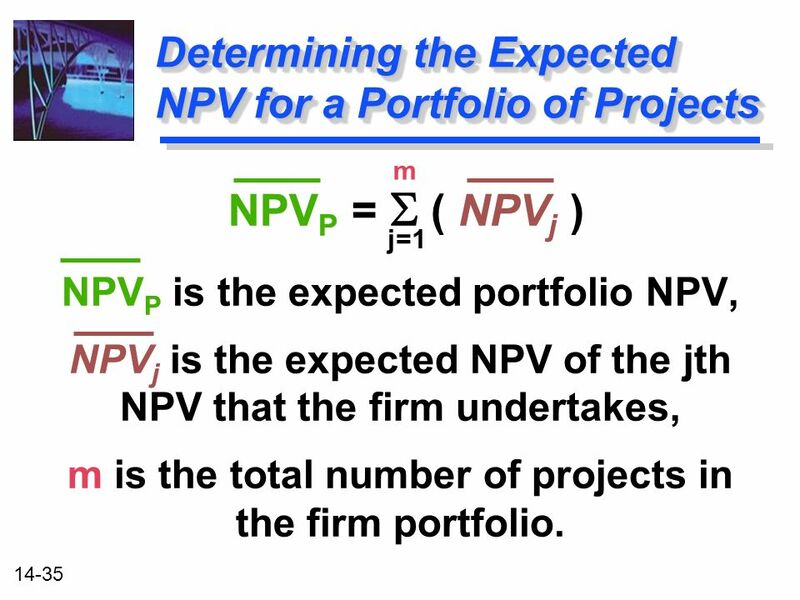 u Describe methods for assessing total project risk, including a probability approach and a simulation approach. 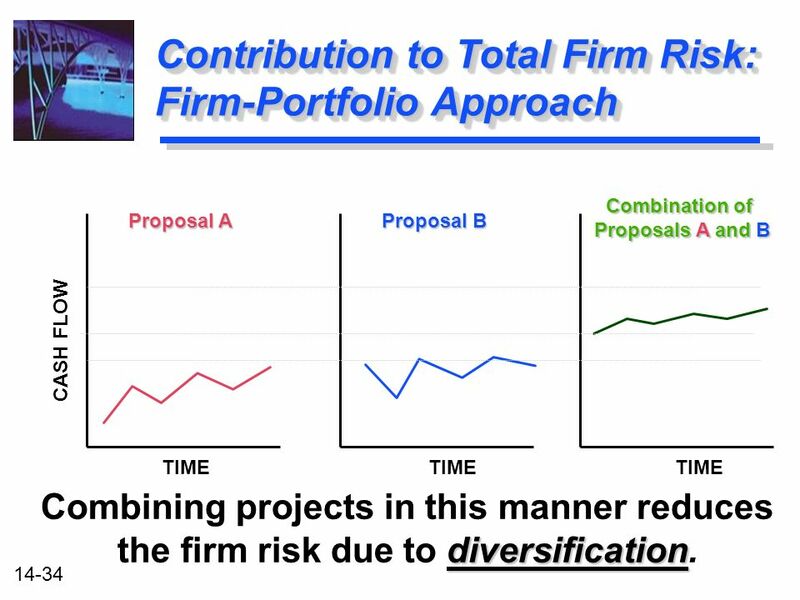 u Judge projects with respect to their contribution to total firm risk (a firm-portfolio approach). 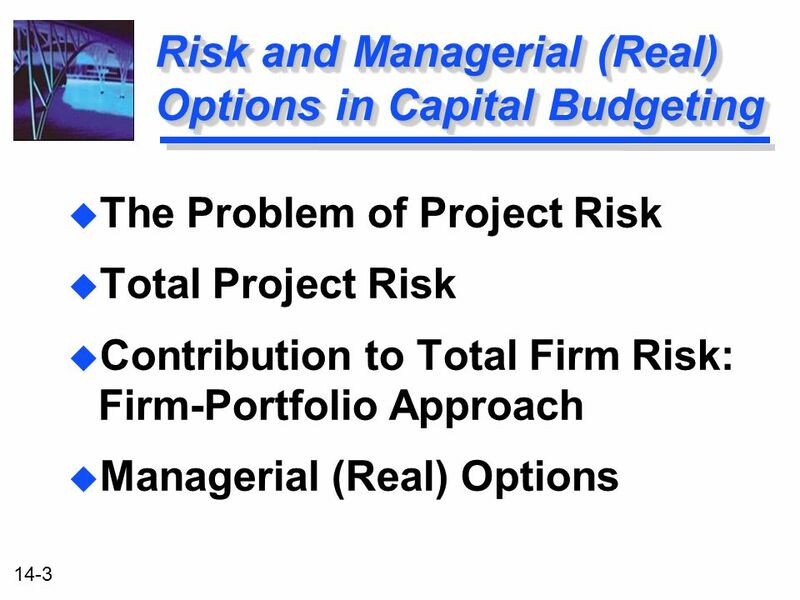 u Understand how the presence of managerial (real) options enhances the worth of an investment project. 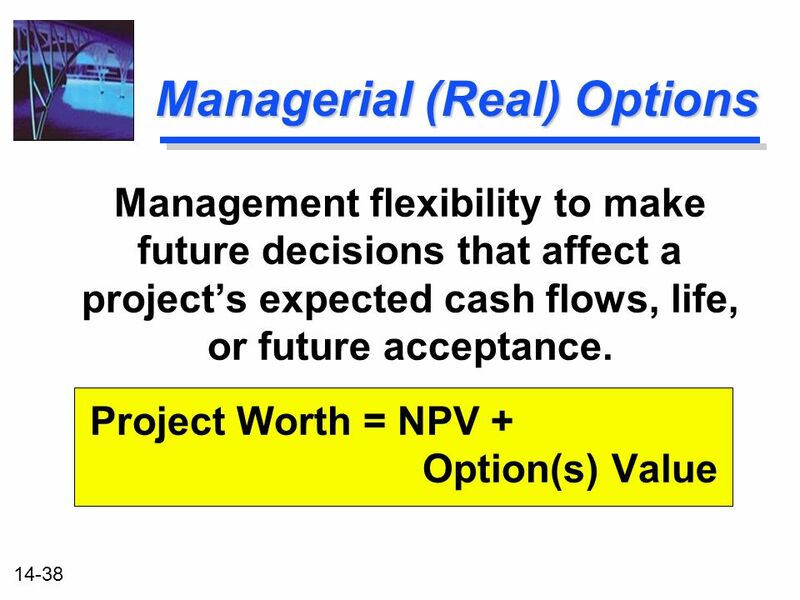 u List, discuss, and value different types of managerial (real) options. 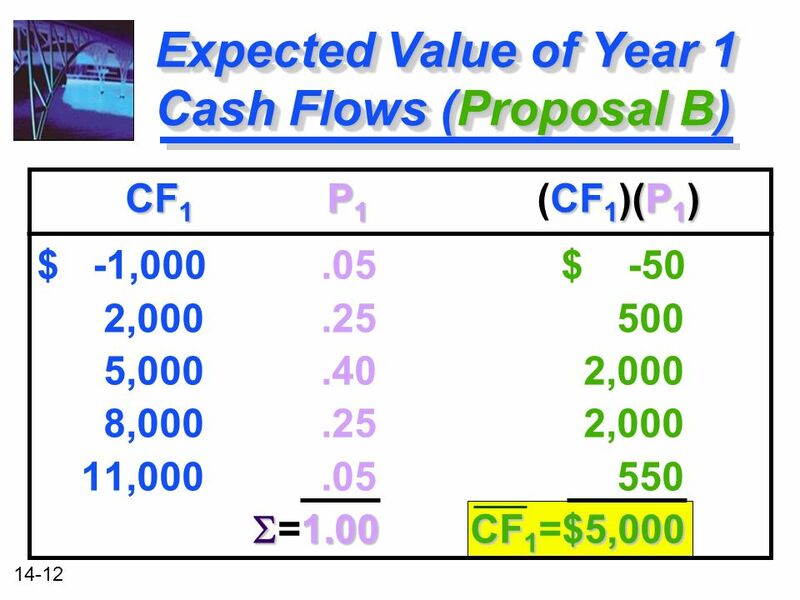 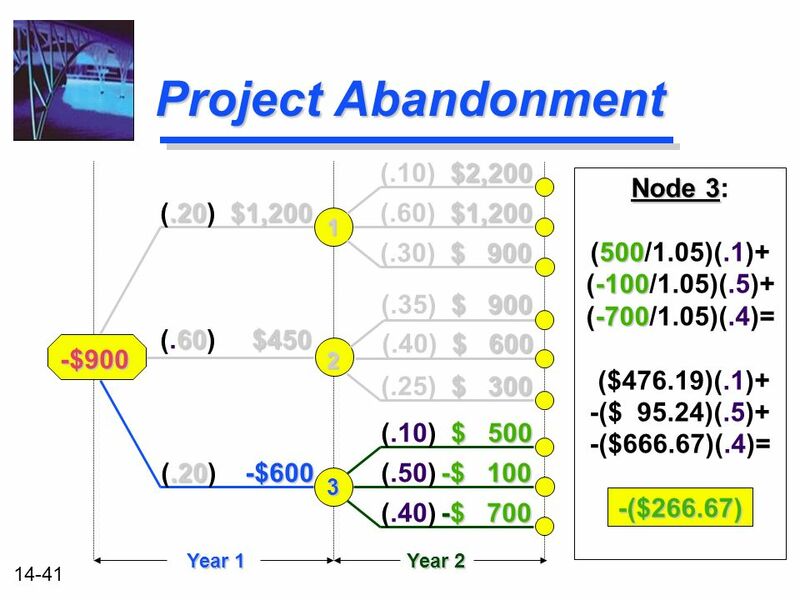 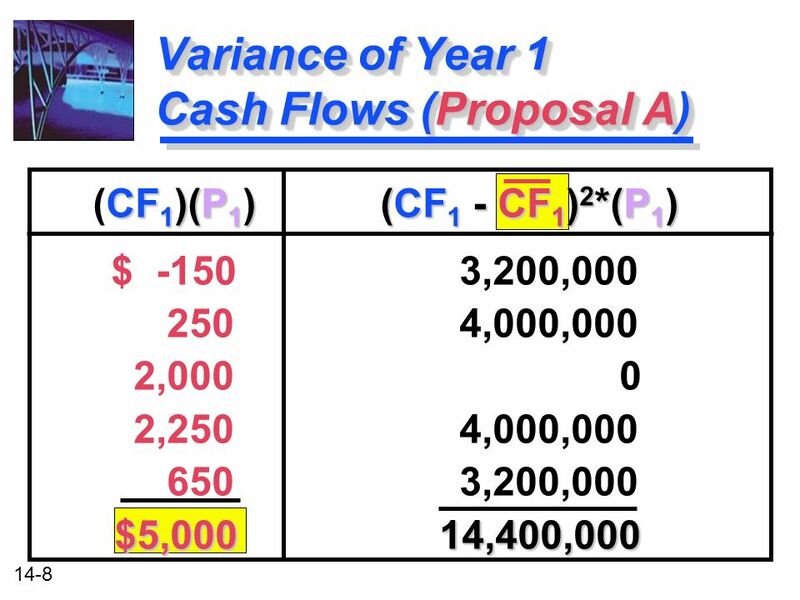 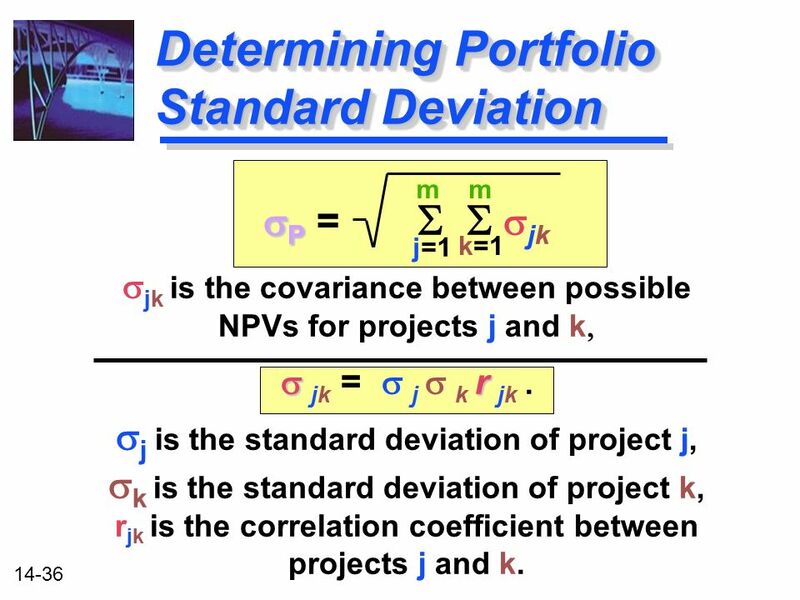 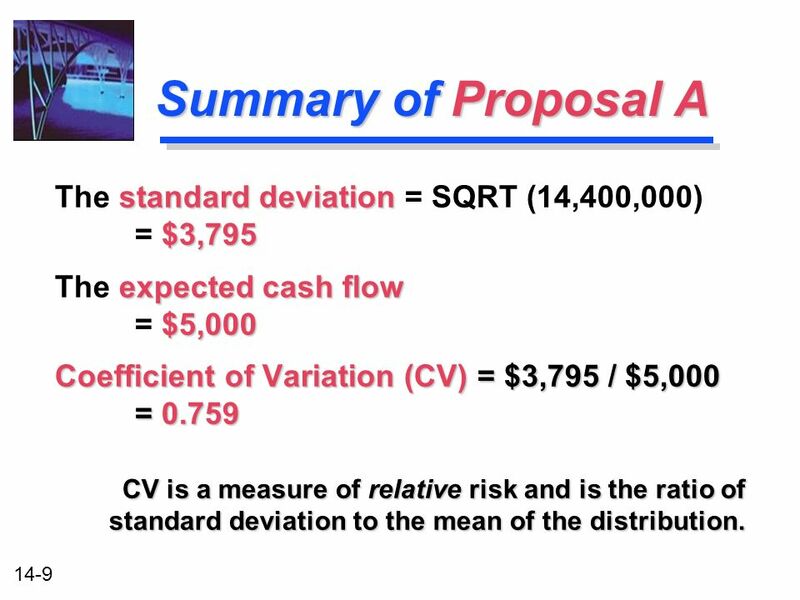 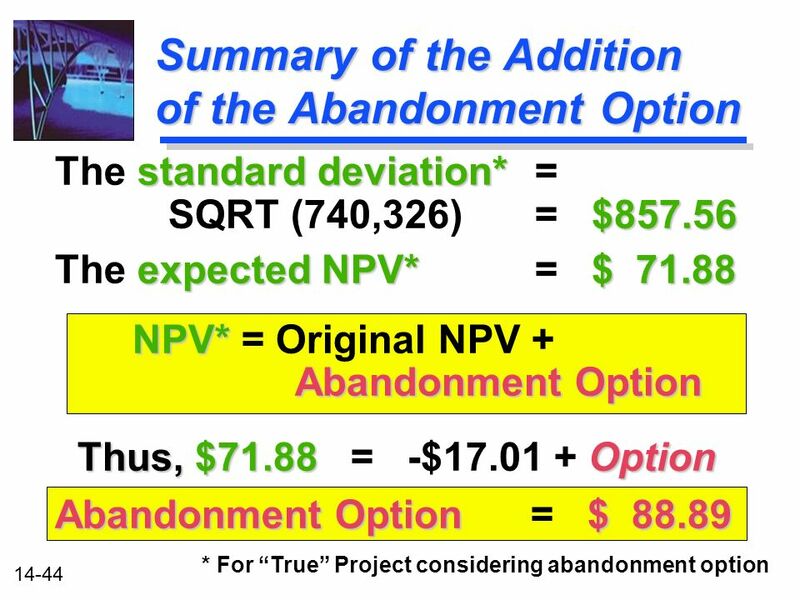 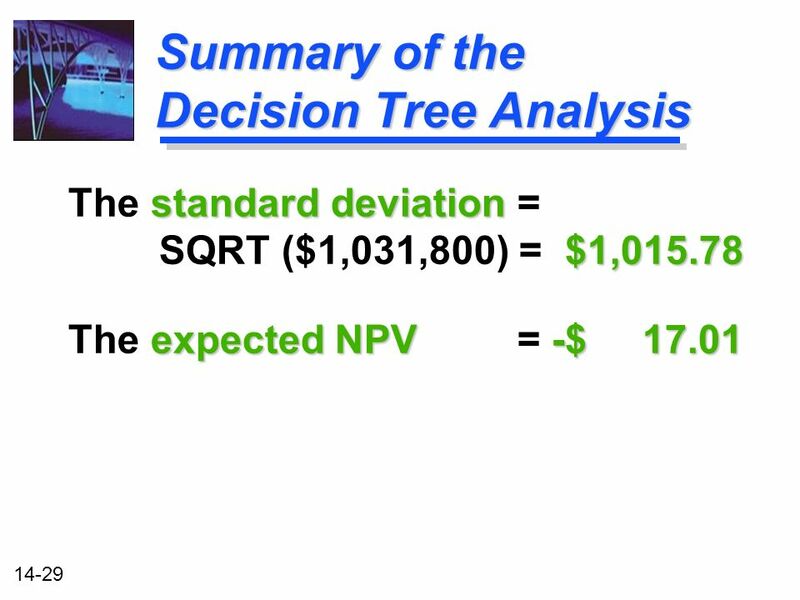 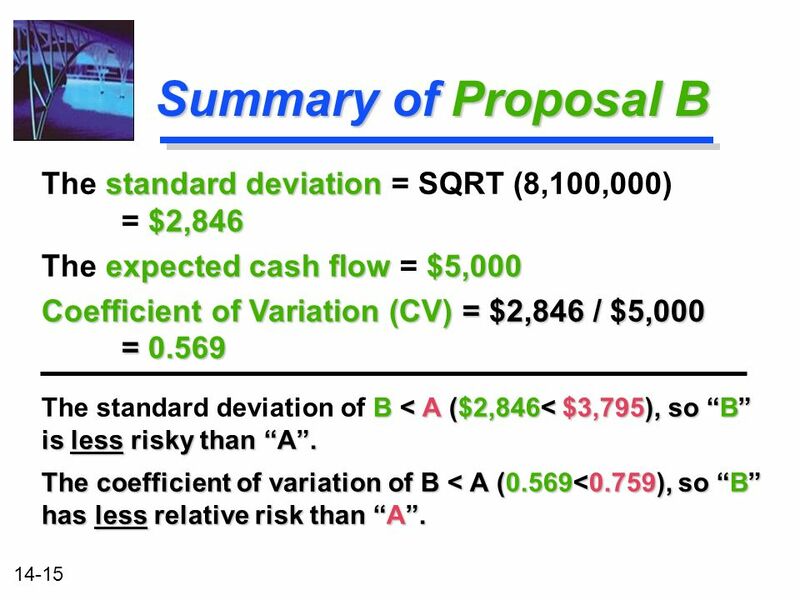 9 14-9 Summary of Proposal A standard deviation $3,795 The standard deviation = SQRT (14,400,000) = $3,795 expected cash flow $5,000 The expected cash flow = $5,000 Coefficient of Variation (CV) = $3,795 / $5,000 = 0.759 CV is a measure of relative risk and is the ratio of standard deviation to the mean of the distribution. 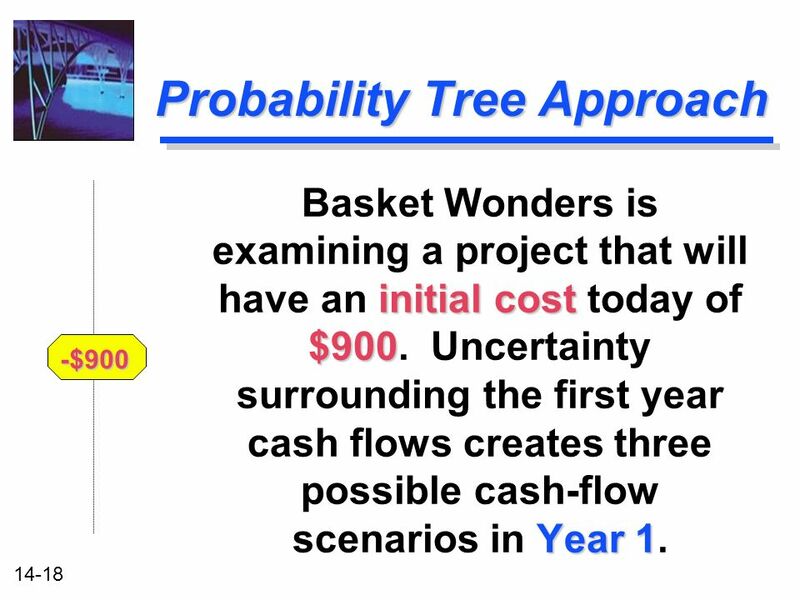 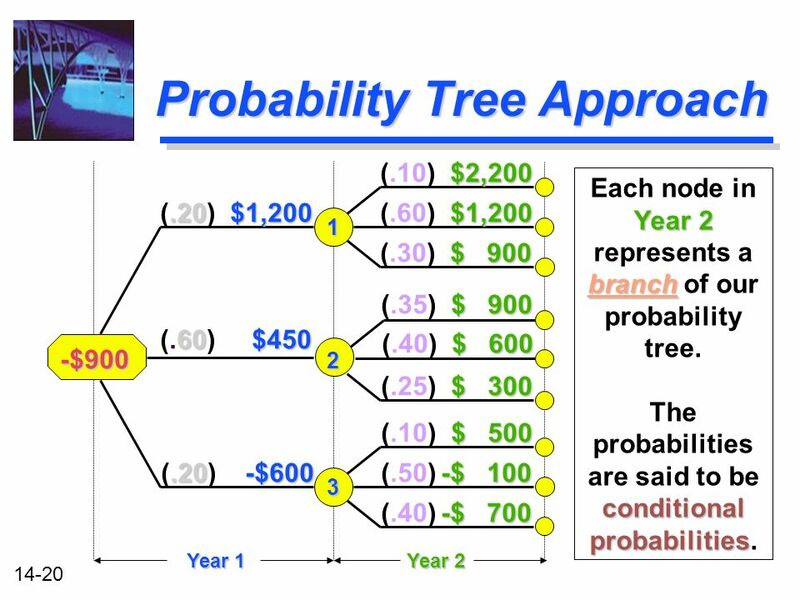 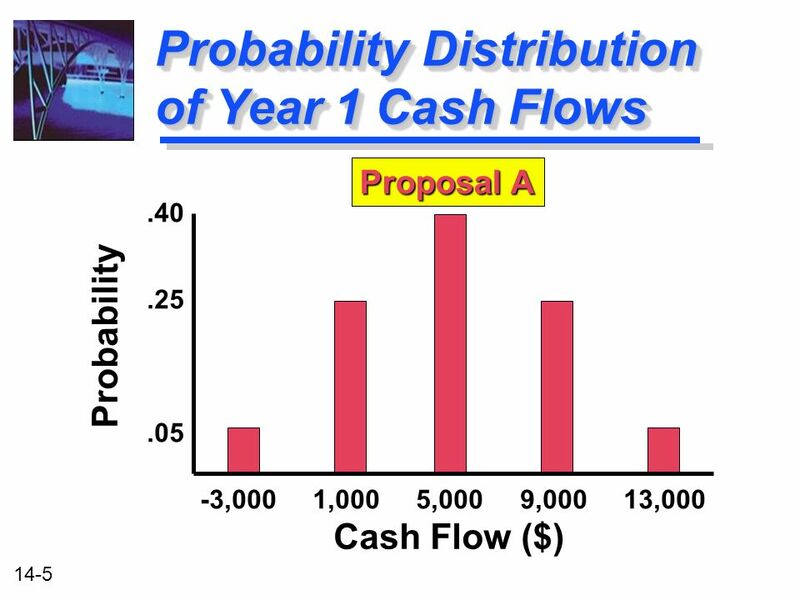 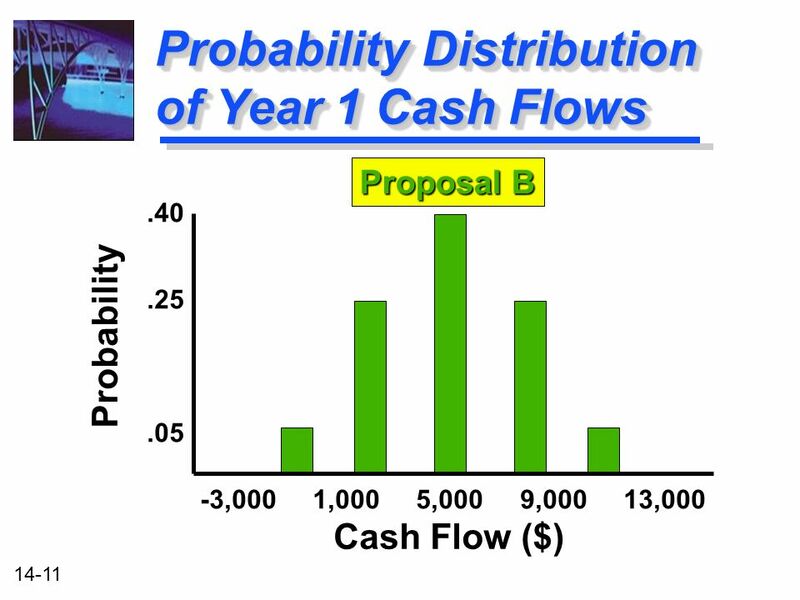 17 14-17 Probability Tree Approach A graphic or tabular approach for organizing the possible cash-flow streams generated by an investment. 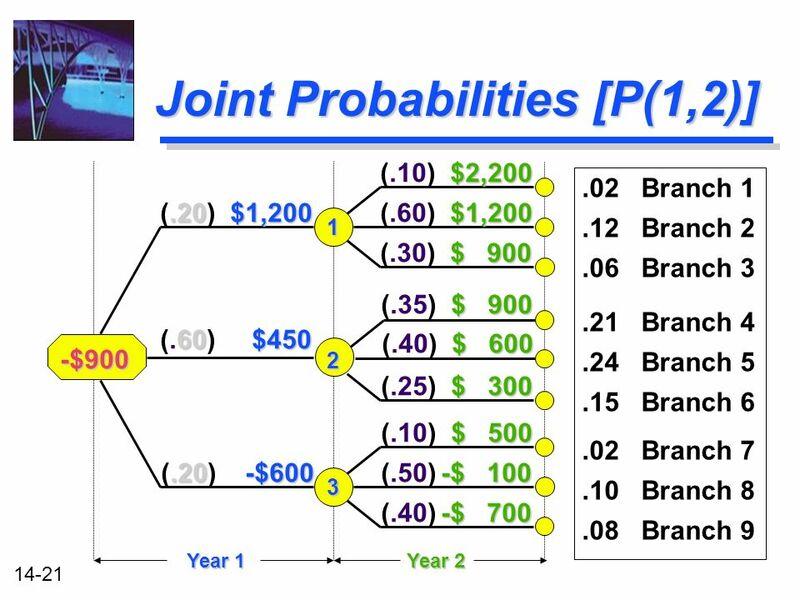 The presentation resembles the branches of a tree. 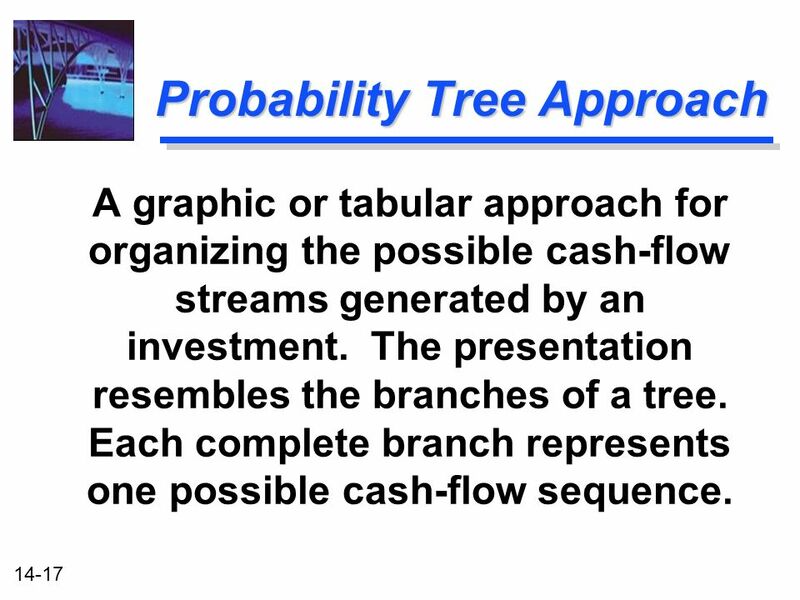 Each complete branch represents one possible cash-flow sequence. 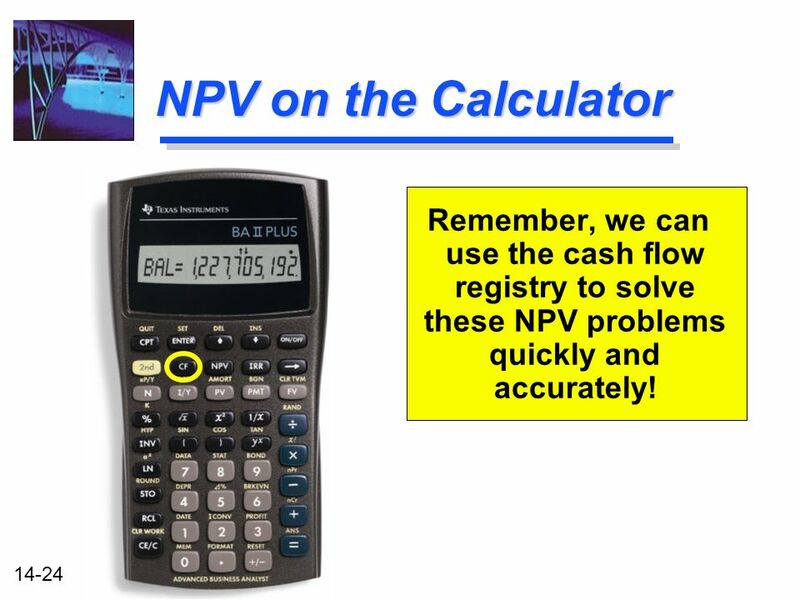 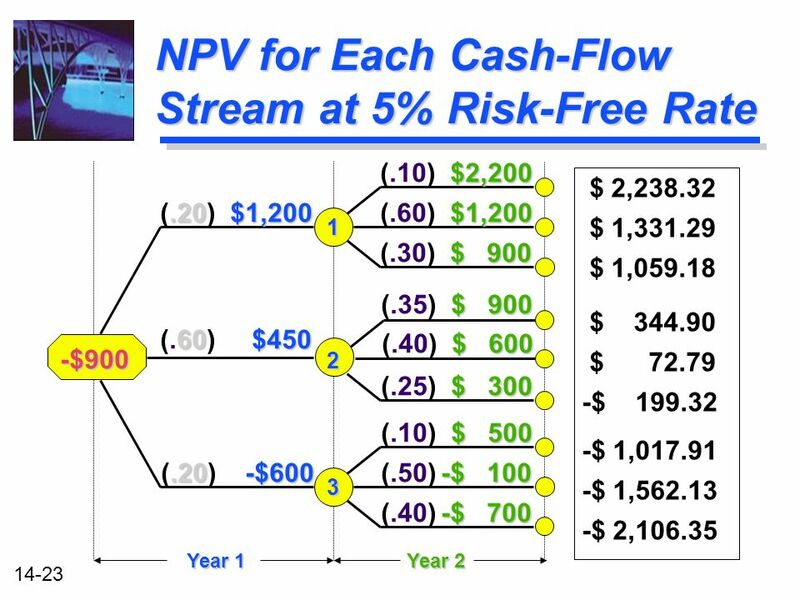 24 14-24 NPV on the Calculator Remember, we can use the cash flow registry to solve these NPV problems quickly and accurately! 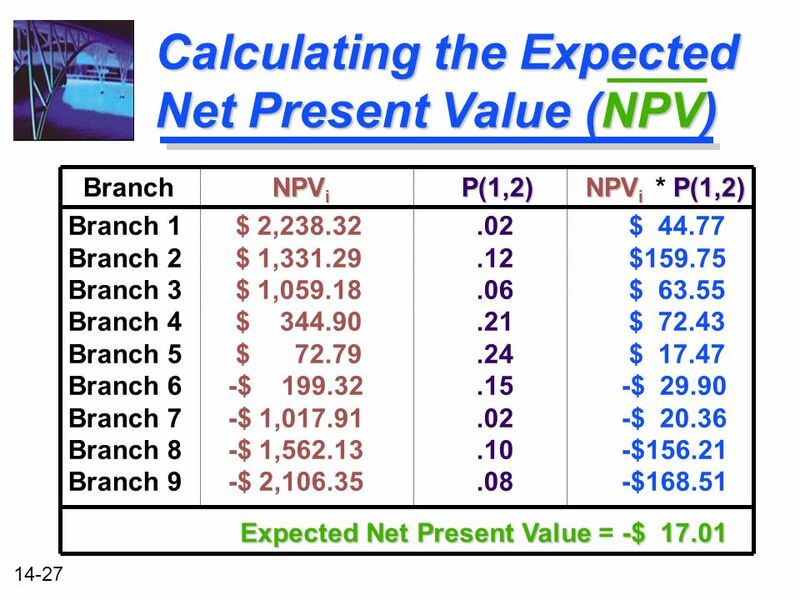 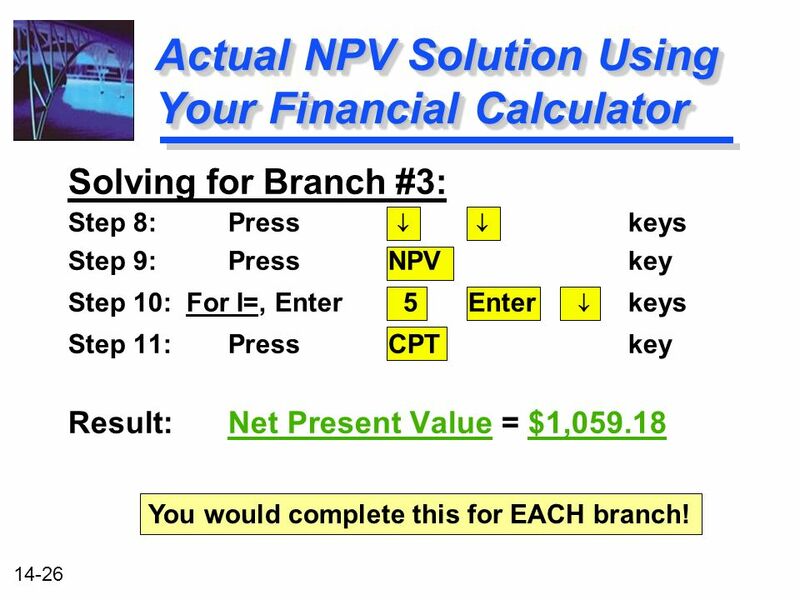 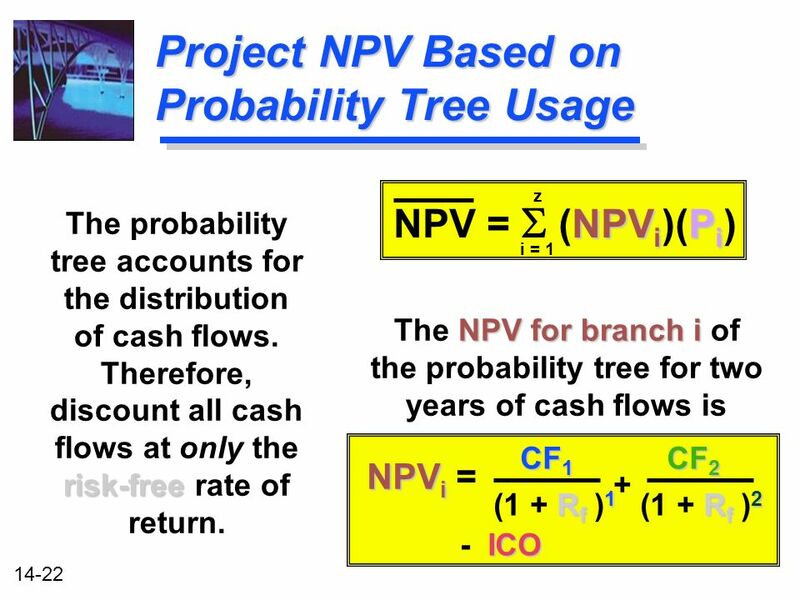 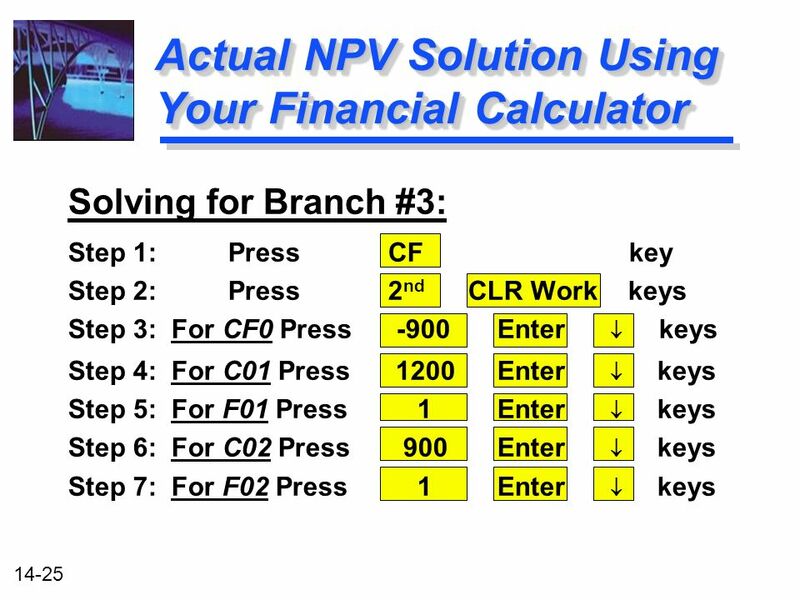 26 14-26 Actual NPV Solution Using Your Financial Calculator Solving for Branch #3: Step 8: Press keys Step 9: PressNPV key Step 10: For I=, Enter 5Enter keys Step 11: PressCPT key Result:Net Present Value = $1,059.18 You would complete this for EACH branch! 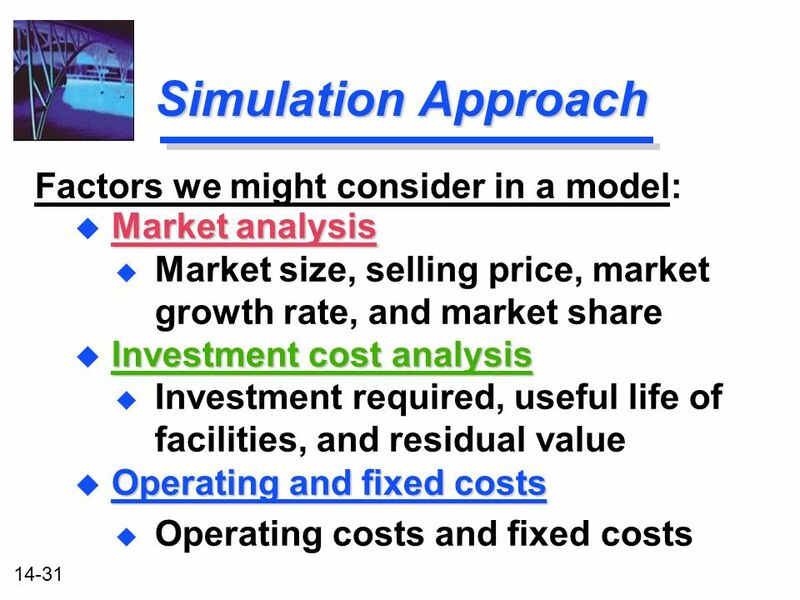 30 14-30 Simulation Approach An approach that allows us to test the possible results of an investment proposal before it is accepted. 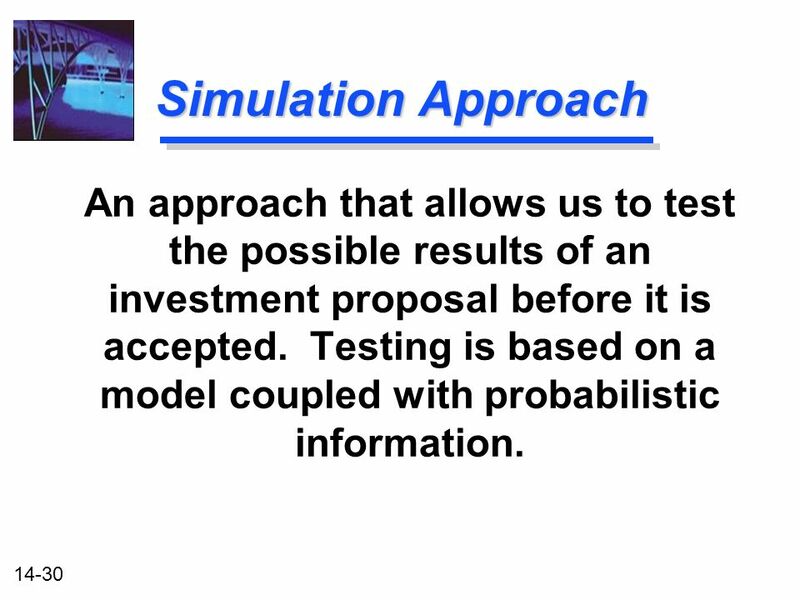 Testing is based on a model coupled with probabilistic information. 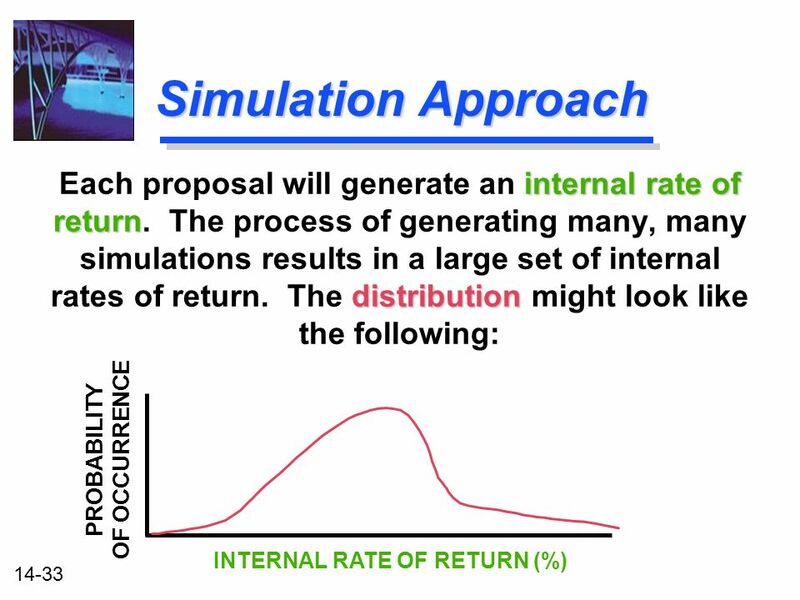 32 14-32 Simulation Approach Each variable is assigned an appropriate probability distribution. 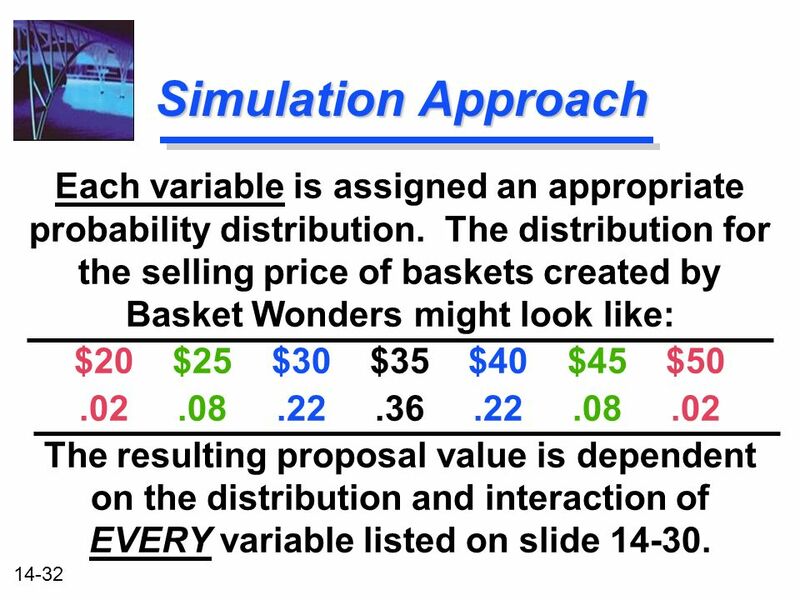 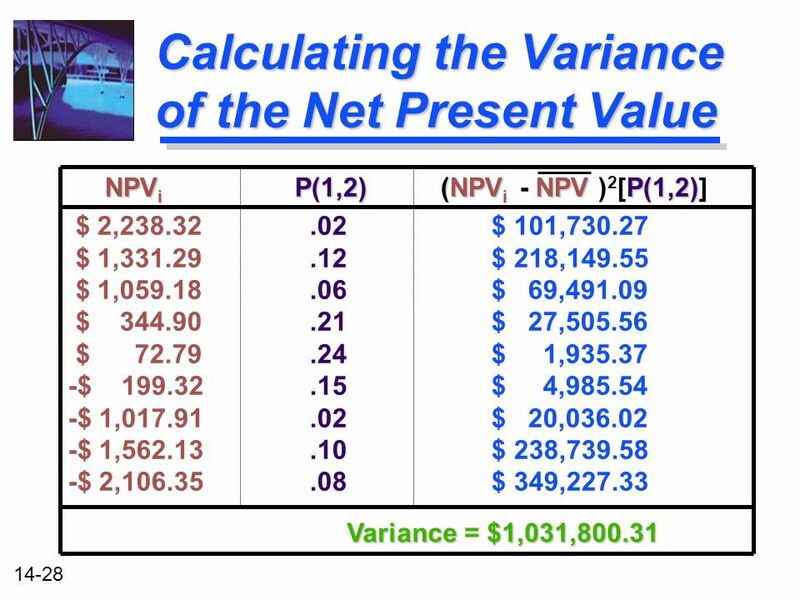 The distribution for the selling price of baskets created by Basket Wonders might look like: $20 $25 $30 $35 $40 $45 $50.02.08.22.36.22.08.02 The resulting proposal value is dependent on the distribution and interaction of EVERY variable listed on slide 14-30. 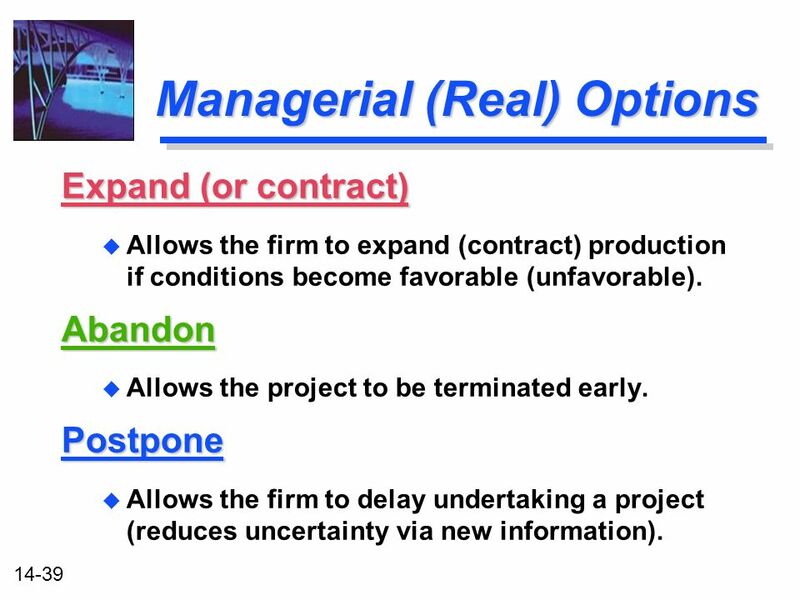 39 14-39 Managerial (Real) Options Expand (or contract) u Allows the firm to expand (contract) production if conditions become favorable (unfavorable).Abandon u Allows the project to be terminated early.Postpone u Allows the firm to delay undertaking a project (reduces uncertainty via new information). 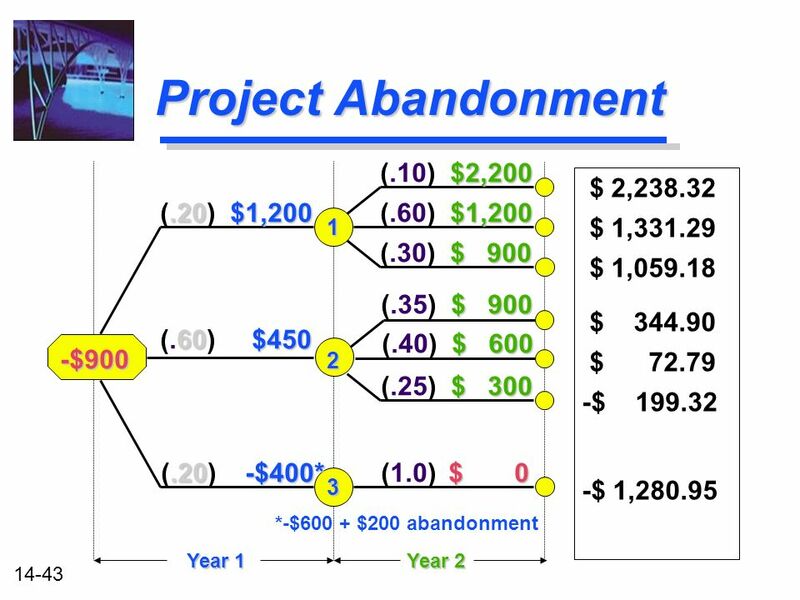 42 14-42 Project Abandonment -$900.20$1,200 (.20) $1,200.20-$600 (.20) -$600 60$450 (.60) $450 Year 1 1 2 3 $1,200 (.60) $1,200 $ 900 (.30) $ 900 $2,200 (.10) $2,200 $ 900 (.35) $ 900 $ 600 (.40) $ 600 $ 300 (.25) $ 300 $ 500 (.10) $ 500 -$ 100 (.50) -$ 100 -$ 700 (.40) -$ 700 Year 2 Year 1 $200 The optimal decision at the end of Year 1 is to abandon the project for $200. 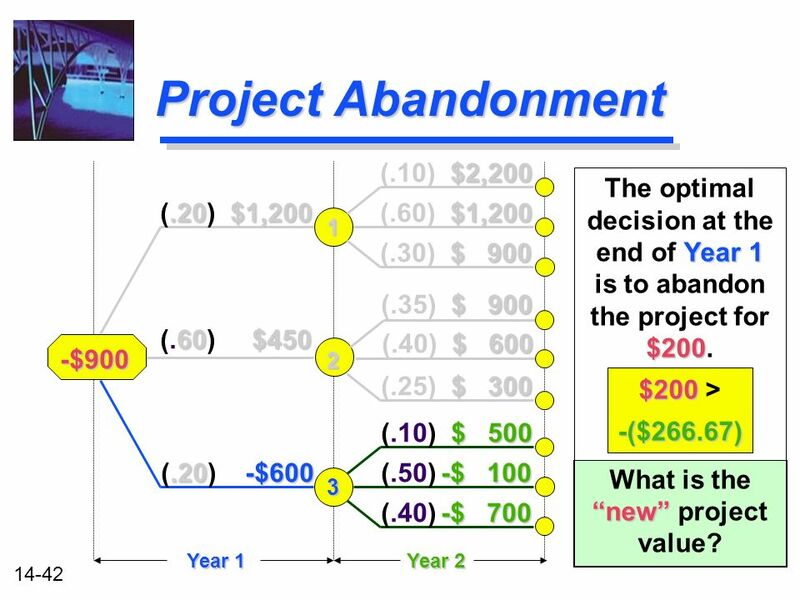 $200 $200 >-($266.67) new What is the new project value? 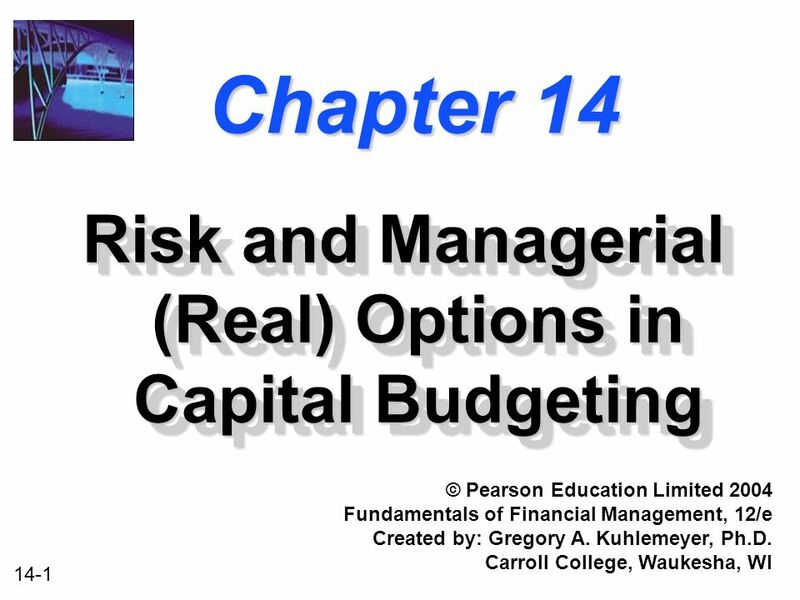 Download ppt "14-1 Chapter 14 Risk and Managerial (Real) Options in Capital Budgeting © Pearson Education Limited 2004 Fundamentals of Financial Management, 12/e Created." 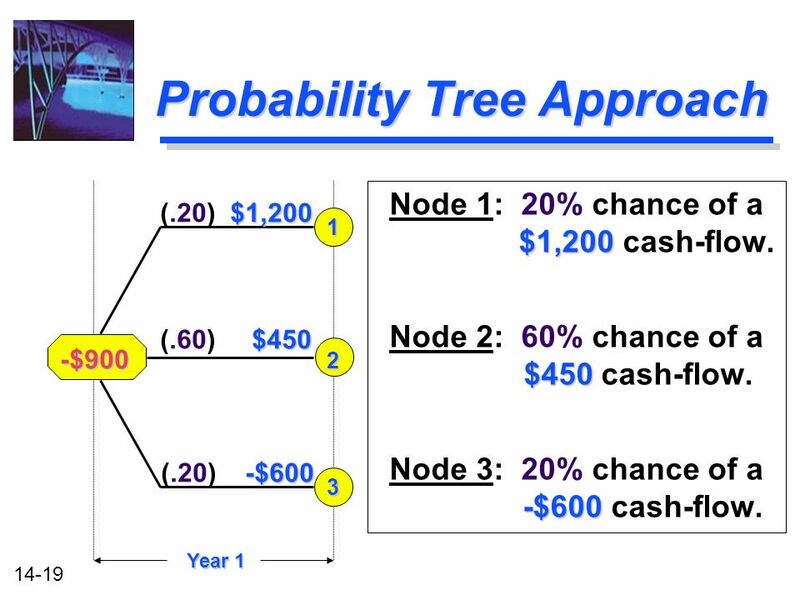 1 Options. 2 Options Financial Options There are Options and Options - Financial options - Real options.